One Seagrove Place is located on Seagrove Beach, in the heart of the scenic Highway 30A region of Northwest Florida’s Emerald Coast. 30A is 18 miles of breathtaking coastline road that passes through several beachfront communities, each with its own distinctive style. 30A is a haven for artists, and is home to numerous galleries and boutiques, along with funky beach bars and unique gift shops. 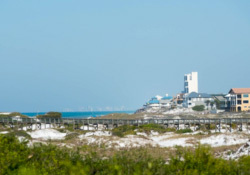 The beaches of South Walton area also boasts many charming accommodations and upscale resorts, as well as dining options that include world-class 30A restaurants and intimate seafood eateries. Our 30A beach vacation rentals are the perfect place for family vacations, family reunions, romantic getaways, and honeymoons! Seagrove Beach is located conveniently to all that scenic Highway 30A area has to offer. The resort provides an idyllic escape with its soft, white sands, sparkling emerald-green waters, and spectacular sunsets. Visitors will enjoy the peaceful and serene atmosphere the community offers. Seaside is centrally located on 30A just west of One Seagrove Place. It is home to numerous shops, art galleries, restaurants & bars including the popular Bud & Alley’s. It has the vibrant town center around which everything is located. Rosemary Beach is an intoxicating beachfront community that is nothing short of breathtaking. The town has the look and feel of a picture-perfect Bavarian village, yet the quaint and intimate atmosphere blends beautifully with its casual Florida vibe. An elegant downtown area houses sophisticated shops, fine restaurants, and sidewalk cafes. Grayton Beach is an artist’s ocean paradise. Small galleries, boutiques and numerous dining options complement a sugar-white sand beach and a laid-back atmosphere. Visit the famous Red Bar – a popular beach hangout offering live entertainment and great food, or walk the nature trails and oceanfront pathways at Grayton Beach State Park. WaterColor is an exclusive beachfront community surrounded by a natural 220-acre coastal dune lake. This resort and residential community exudes southern charm and grace, and offers a laidback, welcoming atmosphere. Visitors will also enjoy WaterColor’s many shopping and dining options at the Town Center. Alys Beach is an idyllic Gulf-front 30A spot that is home to two fantastic restaurants — the casual yet upscale George’s, and Caliza, an elegant dining paradise. Alys Beach boasts a very Spanish ambience, thanks to its white-washed buildings, cobblestone walkways and remarkable architecture. This entry was posted on Thursday, June 28th, 2018 at 11:48 am	and is filed under Blog. This post is tagged: 30-A Vacation Rentals, Family Reunions 30A, Family Vacations 30A, Honeymoons 30A, Romantic Getaways 30A, Rosemary Beach Condo Rentals, South Walton Beach Rentals. Both comments and pings are currently closed.